After 2 months of intense network re-designing (mixed with a little bit of vacation days) and following my two previous posts about Flexible Frame Matching and Flexible VLAN Tag Rewrite, i finally found some free time to write a post about the third step in configuring service instances using the EVC framework : Flexible Service Mapping. Besides all of the above, by using the EVC framework you can combine multiple different services from different physical ports, i.e. when using multipoint bridging (aka bridge-domains), in order to put them into the same virtual circuit. Local connect is a L2 point-to-point service between two service instances on the same system. The service instances can by under the same port (hair-pinning) or under different ports. In contrast with the traditional L2 bridging, this one doesn't use any MAC learning and it's solely between 2 points. Also Local Connect doesn't require any global VLAN resource. In order to have the following two service instances connect to each other by a L2 point-to-point service, you need first to remove their difference, which is the outer tag (you can also remove both tags). Note : You can use the same service instance number under different physical ports. In order to have the following two service instances be connected by Local Connect, you don't need any VLAN tag rewrite, because they both have the same vlans. In order to have the following two service instances be connected by Local Connect, you can either translate the vlan on one of them, or remove the tags on both of them. Scalable EoMPLS or EoMPLS xconnect is a L2 point-to-point service between two service instances on different systems. Like Local Connect it doesn't use any MAC learning and it's solely between 2 points. It also doesn't require any global VLAN resource (this applies to scalable EoMPLS only; for SVI-based EoMPLS check VPLS below). Note : By default, VC type 5 is used for EoMPLS. In case VC type 4 is negotiated and used, an additional tag will be added after the VLAN tag rewrite configuration and before the data gets EoMPLS encapsulated. Note : Have a look at Scalable EoMPLS for additional information. Multipoint Bridging uses the concept of bridge-domains. Bridge-domain (BD) is like a traditional L2 broadcast domain where MAC-based forwarding is used for communication between participants (i'll try to write a new post with more details about bridge-domains). Bridge-domains use global VLAN resources. In the following example, three service instances are put into the same bridge-domain by translating the tags where necessary. a) L2 trunk ports remove automatically the tag on ingress and add it automatically on egress. Equivalent EVC ports need that to be done manually by using the appropriate rewrite actions. b) L2 tunnel ports add a new tag on ingress and remove it on egress. Equivalent EVC ports do not need any similar rewrite actions, because by default bridge-domains add a new tag on top of the already existing one. In the following example two ports (a L2 trunk port and an EVC port) are put into the same bridge-domain (Vlan 20). Tag 10 needs to be removed from the EVC port before it joins bridge-domain 20. In the following example two ports (a L2 tunnel port and an EVC port) are put into the same bridge-domain (Vlan 20). On the EVC port, tag 20 is added on top of tag 10 in order to have the incoming frames join bridge-domain 20. VPLS or SVI-based EoMPLS can be accomplished by configuring xconnect under a SVI. This SVI is the same as the one defined by the bridge-domain ID. By adding "split-horizon" after the bridge-domain ID in both service instances, there can be no L2 communication between them. By adding an additional tag through a rewrite action in both service instances, you can differentiate them, while they are being transfered through the same VC. SVI-based EoMPLS can be considered like a VPLS, where there is only one VC pointing to one neighbor. Note : Have a look at SVI-based EoMPLS for additional information. 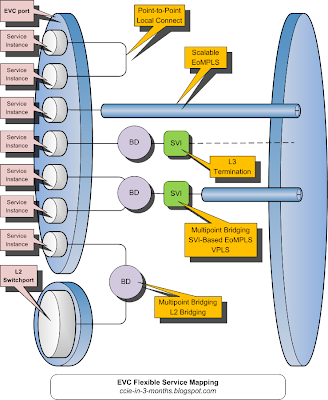 For L3 termination you have the usual two options : use subinterfaces or use bridge-domains (just like switchports) and SVIs. ES/ES+ and SIP-400 cards support termination of double-tagged traffic too. Note : ES cards have a major limitation : single-tagged vlans configured under a subinterface are global significant. On the other hand, double-tagged vlans are local significant. On the ES+ and SIP-400 cards, both single-tagged and double-tagged vlans are local significant.